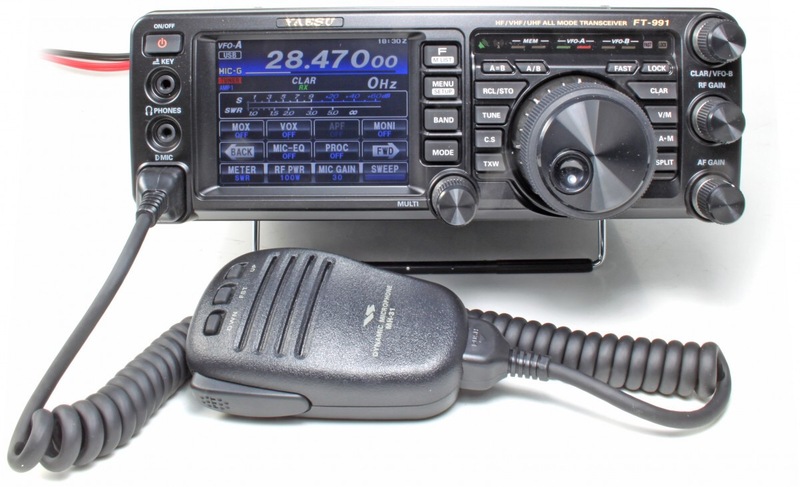 The Yaesu FT-991 from Waters & Stanton, Europe's Ham Store is the next generation in all band HF to UHF transceivers which includes Yaesu's own System Fusion Digital FM capability. The FT-991 has more traditional modes too which include CW, AM, FM, SSB, along with Digital Modes (Packet, PSK31, RTTY and C4FM) also being catered for. Output is 100 Watts of HF/50mhz Capability droppoing to 50 Watts for VHF and up. The FT-991 includes a high-res full color 3.5" TFT Touch panel for superior operability and visibility, this includes a High Speed Spectrum scope with Automatic Spectrum-scope control too which finishes the radio nicely! The FT-991 is designed for to allo the most dedicated of contesters or most casual of hobbiests to enjoy top-quality performance, with a suite of new features to enhance the experience, no new or experienced user will be dissapointed. Whether the intended use is primarily is home, mobile or in the field, the FT-991 will provide outstanding fundamental performance! Recognising an all-important Golden Rule Amateur Radio - “You cannot work them if you cannot hear them”– the FT 991 features a rugged state-of-the-art highly balanced receiver circuit configuration. The high-speed floating point TMS320C6746 DSP chip (3000 MIPS / 2250 MFLOPS) from Texas Instruments used in the receiver design guarantees excellent interference rejection with actual signals under real-world conditions, not only on HF but also in the VHF and UHF bands. The 1st IF frequency incorporates selectable robust 3 kHz and 15 kHz roofing filters that effectively attenuate interfering signals. The triple conversion circuit structure allows highly flexible gain distribution at each stage. This proven receiver design architecture enables elimination of unwanted signals through filters at each stage as well as optimized gain distribution. Advanced Spectrum Scope with ASC (Automatic Spectrum-Scope Control) located just below the LCD display gives the operator all the information for comfortable QSO on the DXing scene. The FT-991 could not provide functions easier than at your fingertips with a 3.5" Full Color TFT Display for Superior Operability and Visibility. The FT-991 can be connected to a computer using a USB cable for CAT control and firmware updates, or the use of an optional SCU-17 Interface Unit to support USB Audio In/Out, TX Control (PTT, Key, Shift). The RF Amplifier in the FT-991 provides a clean and solid 100 Watts of Operating Power (50 Watts VHF/UHF) and is combined with a large heat-sink and forced air automatic cooling fan to increase operating time and prevent overheating. The FT-991 Comes in a compact, lightweight package suitable for portable, mobile and base installations. Measuring 8.8"(W) x 3" (H) x 9.9" (L) at just 9.7 pounds this robust full featured mobile/portable radio is ready to go when and where you are! Internal High Speed Automatic Antenna Tuner included in the package. The antenna tuner uses a LC switching network that has a large capacity 100 channel memory. The tuning data is automatically memorized to reduce tuning time when changing frequency. +/-0.5PPM High Resolution DDS/PLL local Oscillator included as part of the standard package. It is the customers responsibility to check if the radio license is required to operate the radio. Please check if the radio specifications comply with your local radio regulation.